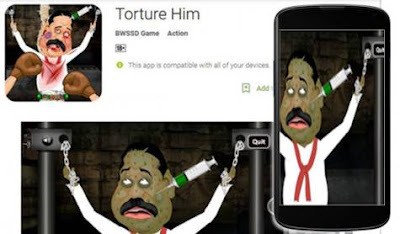 An android game named “Torture Him” available at the Google Play Store has garnered severe criticism from many sectors for enabling its players to torture a character based on former president Mahinda Rajapaksa. The android game depicts a caricature of current parliamentarian Mahinda Rajapaksa and lets its users torture the character using shoes, syringes, electricity, a noose and other torture devices. While over 1000 users have down voted the android game giving it a single star, over 500 users have ranked to between 2 -5 stars. According to stats provided by Google Play Store the app had been updated on January 10, 2016, while approximately 50,000 - 100,000 users have installed the game in their devices. Social media post too can be seen circulating creating awareness regarding this application and requesting users to report and down vote the application. Many social media users have described the android game as vile, unethical and offensive. Attempts to contact the publishers of the game was unsuccessful.